I Believe when most people from out of state think about fishing Florida they probably think of snook fishing in Tampa Bay or fishing the gin clear waters of the Keys for bonefish or permit. Along with that fishing comes the crowds. In Wakulla County we don’t have snook, bonefish or permit. But if you want to float down a lazy, scenic river and cast for bass, skull around a cypress lined pond pitching beetle-spins for hand sized bream, fish the flats for red fish and speckled trout or head out to the open gulf in search of grouper and red snapper then you’re in the right place, and without the big crowds. The Wakulla, St. Marks and Ochlockonee Rivers are teaming with all types of freshwater fish and in the winter produce many saltwater species looking for warmer waters. 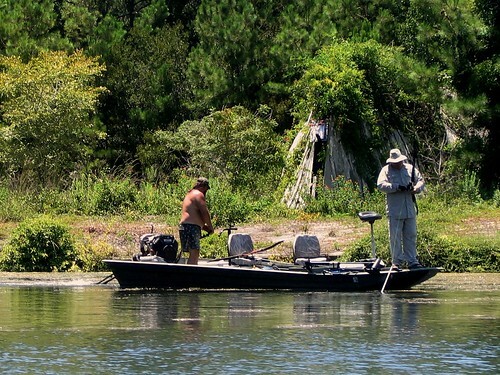 Otter Lake and many other small refuge ponds and lakes dot the landscape of Wakulla County and can produce trophy-sized bass, bream and speckled perch. If saltwater fishing better suits your fancy then you better get ready to get you line stretched. The Wakulla County shoreline goes from the East bank of the Ochlockonee River to a point several miles East of the St. Marks River. Numerous creeks and tributaries flow off the bay and produce fantastic fishing in the fall and winter for trout, red fish and sheepshead and also provide some of the most spectacular scenery of anywhere in the state. As the waters warm in early spring the trout head for the shallow grass flats along our shoreline. At this time most people’s attention turns from creek fishing to drifting the flats and casting artificial lures or live baits for speckled trout and whatever else might be hungry. Usually by early April huge schools of baitfish start appearing and behind them are Spanish Mackerel and ladyfish. By the first of May cobia will appear and at this time everything that swims in our bays are here except tarpon which typically show in good numbers around the end of May or first of June. Fishing will slow somewhat in the heat of the summer, except for tarpon fishing, but by the end of August and first of September fishing will pick back up and continue to be good through the fall and early winter. If you want a little more weight on the end of your line it’s a short ride to some of the best grouper fishing in the State of Florida. Both black and red grouper are abundant as well as red snapper, amberjack and king mackerel. Bottom fishing is probably the most popular method of fishing offshore though in the past decade, trolling for grouper in early spring, fall and winter has become very popular and also very productive. The most popular launching ramp in Wakulla County is at the St. Marks Lighthouse, which is only minutes from the bay. Others like to put in at the city of St. Marks so that they are they are able to flush their engines with freshwater on their return trip. There are numerous other boat ramps located throughout the county and all are just minutes away from excellent fishing, both salt and fresh. Be sure to know your limits and license requirements before heading out and always monitor the weather. Thunderstorms can blow up rather quickly in the summer and ruin a good day on the water. Always leave a float plan with someone and be careful on the water. Good luck and good fishing! St Marks Outfitters is a full service guide, and kayak rental business.